AFC Fylde have signed midfielder Mason Fawns on loan from Oldham Athletic for the rest of the season. The 19-year-old broke into the Latics first-team at the start of this season, making six appearances in first four weeks of the campaign. He played in four League One games, including the 2-1 defeat at Blackpool, and has since had a loan spell at Ashton United. A product of the Blackburn youth set-up, Fawns joined Oldham in the summer of 2016. Fylde manager Dave Challinor is eager to see what his new man can do. Challinor said: “This gives us a good chance to have a look at another talented young player and give him some first team experience. “We have a lot of games coming up, so to have more numbers can only be beneficial. We can’t have too many good players at the moment. Fawns becomes the third Oldham player to spend time with the Coasters on loan this season following George Edmundson and Jamie Stott. Fylde made space for Fawns by loaning out midfielder Tom McCready to Challinor’s former club Colwyn Bay on a one-month deal. 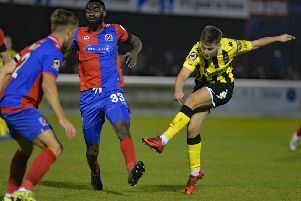 The 26-year-old joined the Coasters in August following his release by Exeter but has managed only nine senior appearances.